In the previous post on this series, I looked at the idea of a residential land footprint – the amount of land each person takes up for their home. I also created a chart (updated here) that shows the different living conditions in the Seattle metropolitan area. The best use of this land footprint curve is to have an easy way to compare the land use of our region to other regions. I chose five metropolitan areas that I thought would be interesting to compare to Seattle. New York City stands alone in the US with regard to land footprint. The average person uses far fewer square feet of land. This is accomplished by stacking residences, allowing more people to share the same amount of land. Note that peak of 300 sf per person might be uncomfortable in a single-story world (keep in mind this includes your share of yard, street, and alley), but by building up each person can have as much floor space to live while using the same amount of land. I was surprised by these two. I had imagined Los Angeles to be more sprawled the San Francisco, but they have very similar curves. It’s interesting to see where the curves cross – SF has more very dense construction, then the curves cross at around 500sf/person. LA has more moderate density units, and at around 4,000sf/person they cross again, leaving SF with more spread out housing than LA. Of course, LA’s metropolitan area only includes LA County and Orange County – and the sprawl I always think of extends beyond these areas. Portland and Seattle are similar. Seattle has more dense housing, Portland had more mid-density housing, and they align again as housing spreads out. However, the most common living condition is significantly more dense in Portland than Seattle (~3,000sf/person vs. ~4,000sf/person). I had included Phoenix just to show what I thought of as a large sprawling city, but was surprised by the curve. 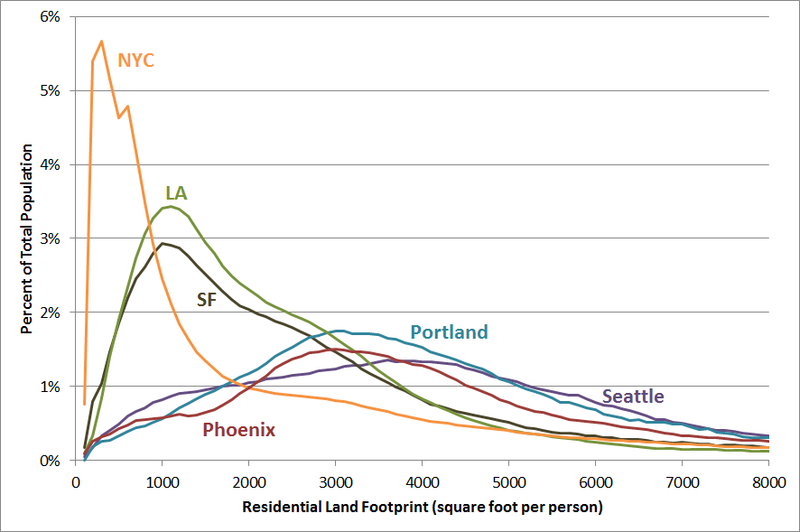 Yes, Seattle has many more people living 2,000sf/person than Phoenix, but Phoenix peaks near Portland at 3,000sf/person then stays lower than Seattle up through the higher footprint homes. Comparing Seattle to these five cities, it’s clear that we have a large land footprint. In the most common living condition, a Seattlite takes up a tenth of an acre for their share of their home alone. Add in the roads and freeways to get to your home (road area likely increases with land footprint), your children’s school footprints (there aren’t many multi-story schools around here), your workplace land footprint, the footprint of your grocery store, and we’re talking about a large amount of land per person. This is wasteful of our forests, our farms, and increases the distance and time needed to travel to any destination. How do we move the peak of our footprint curve to the left? One way is through good transit. NYC started with an above ground railway over 140 years ago, which continued as a great subway system, and expanded from there. Building good transit that takes up little street space helps encourage development with small land footprints – your commute is shorter the closer you live to a transit stop, so building up allows for more people to live at these valuable locations. SF and LA had similar histories, except using streetcars and cable cars. Streetcars aren’t quite as good at concentrating residences as subways, as they stop more frequently. Seattle and Portland also had streetcar histories, but much of our growth came after streetcars were removed and cars became the standard mode of transportation. Of course there’s a lot more to land use than transit – for instance we’ll need to allow growth through zoning – but good transit is certainly a strong force in creating a small land footprint. In the first post in this series, there were some great recommendations on how to change the land footprint graph. In my original version, I graphed the number of blocks in our region that fall into a given land area per person. The suggestion was to instead plot the number of people living at a given land area per person. I’ve taken it a step further and plotted percentage of people living at a given land area per person. 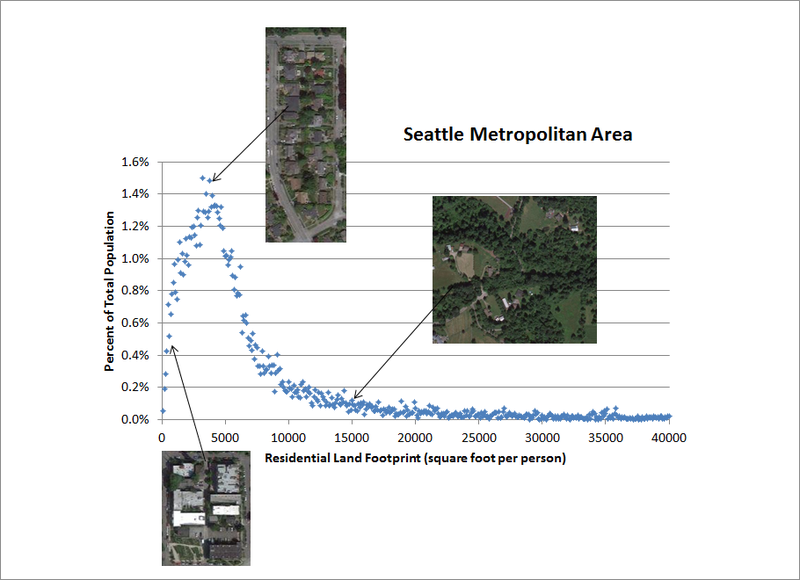 For example, 0.52% of people in our region have a land footprint of around 600sf per person, which corresponds with the Capitol Hill picture below (the bottom left). Graphing using the percentage of total population will allow me to compare regions of different size on the same graph, which will be useful in my next post in this series. Tannerwood, North Bend. The developer calls this “low impact development”. It’s not often that national news and policy affects us directly, but there’s at least one issue that affects everyone: housing. The US has built in incentives to sprawling houses for decades, and a recent report estimates this subsidy at $450B a year. The Atlantic Cities published an excellent summary of this report this Tuesday that’s worth reading. Stepping back and looking at the whole collection, it’s clear that the federal government has favored many types of development at the expense of others, often with weak or outdated logic. The government dramatically favors homeowners over renters. Its support is heavily skewed toward single-family homes over multi-family developments (the FHA, for instance, funneled just one-tenth of its $1.2 trillion in loan guarantees over the past five years toward multi-family housing). The mortgage interest deduction – a program first created in 1913 with the ostensible aim of boosting homeownership – curiously encourages investments in second homes. As we’ve written before at Cities, that massive tax break also primarily benefits upper-income households, despite its billing as a boon for the middle class. Scientists at the U.S. Forest Service and partners at universities, non-profits and other agencies predict that urban and developed land areas in the US will increase 41 percent by 2060. Forested areas will be most impacted by this expansion, with losses ranging from 16 to 34 million acres in the lower 48 states. The agency highlighted the results of a new study in a press release issued last month. In 2010, a study by the American Farmland Trust found that 41 million acres of rural land had been permanently lost in the preceding 25 years to highways, shopping malls, and other development. The rate of recent farmland loss at the time of AFT’s report was an astounding acre per minute. Another record low for inventory, dropping below 4,000 single-family homes for the first time on record. The next building cycle will probably come sooner rather than later, and if we get federal policy right maybe we can build up instead of out, saving the farmland and forests that help make this region great. Just as we each have a carbon footprint, we each have a land footprint. A three person household in a home on 6,000 sf of land (including half the street in front of their home and half the alley) takes up 2,000 sf each person. As the average land footprint decreases, the square footage each person lives in might even remain the same as one story houses go to two or as two story apartments go to six, but the distance they have to walk to the store is lower. In addition to being more walkable, areas with smaller average land footprints can have better transit, pave over fewer forests and farmland, require less roads, sidewalks, sewer lines, electricity distribution, etc. Using US Census data, we can see what kind of land footprint distribution an area has. This can tell us the most common living conditions in an area, and allows us to see how far apart people live in that area. This can also be helpful in comparing land footprints of different cities. Simply dividing the land area of a city by the number of people doesn’t work, since city boundaries are different and politically defined. Below is what I’m naming a residential land footprint curve. The smallest geographical elements the US Census publishes data for is called a “block”. In cities these are often physical blocks bounded by streets, and outside of cities geographical boundaries are generally used. The Census Bureau has divided the US into 8.2 million blocks. All I’ve done is taken data from Seattle’s metropolitan area (the census definition is: King, Pierce, and Snohomish counties) and sorted the number of square foot per person in each block into “bins” of 100, then plotted the number of blocks in each bin. For example, there are 2 blocks in Metropolitan Seattle that have a density of between 0 and 100 square feet per person, 15 blocks between 100 and 200, 29 between 200 and 300, etc. This curve allows us to easily identify the land footprint characteristics of a metropolitan area. 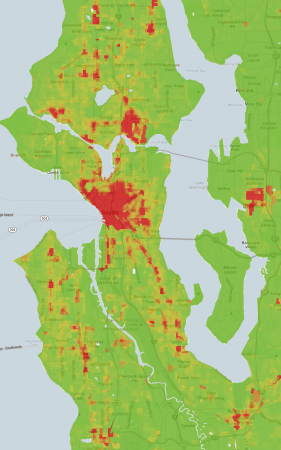 For Seattle we can see that the most common living condition is around 3,800 square foot per person. Below that there’s a fairly linear distribution down to the densest blocks. This is mirrored above 3,800 until we reach around 7,000, where we start seeing a more gentle decrease. Few “blocks” (however they’re defined in rural areas) have 40,000 or more square foot per person inside our metropolitan area, but they do exist (I’ve truncated the chart to keep it readable). In the chart below I’ve added pictures of actual blocks, to help visualize what these land footprints look like. The picture on the bottom left is a block on Capitol Hill, one of the 81 blocks with a density between 400 and 500 sf per person. At the top of the curve is a block in Magnolia, one of the 654 blocks with a density between 3,700 and 3,800 sf per person. 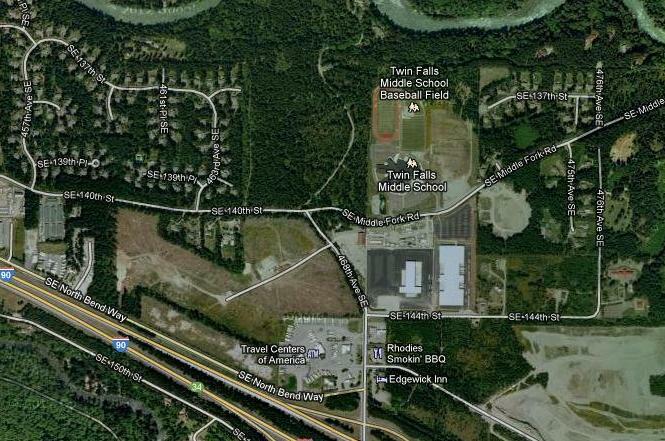 On the right is an area in Renton, one of 47 blocks that have between 14,900 and 15,000 sf per person. 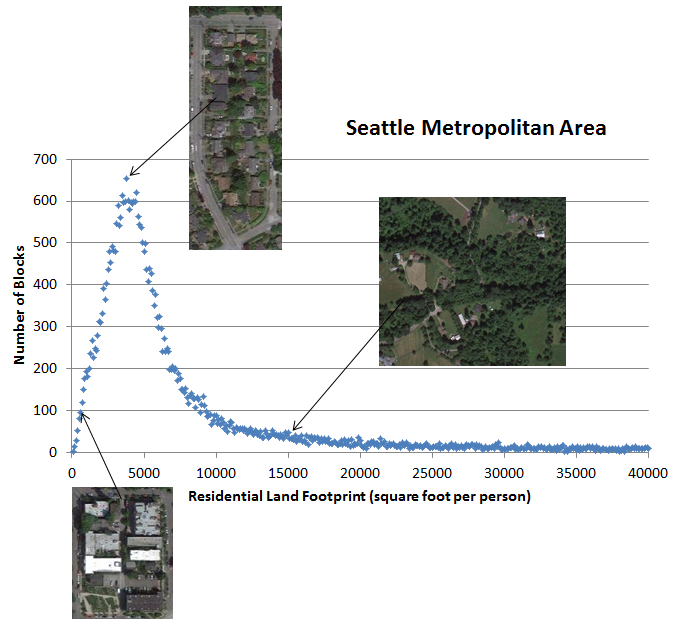 In my next post in this series I’ll compare Seattle’s land footprint curve to curves from other cities. The Seattle Planning Commission held a panel debate this Wednesday featuring two sides: the developers v. the neighbors, with a Planning Commission representative in the middle. Over the past year there’s been construction of single family homes on small lot sizes, using loopholes in Seattle’s land use code. Because our building codes were written for certain minimum lot sizes, many of these homes have smaller than usual setbacks, and often feel like they’re quite tall (though technically built to the same height allowed for other homes). Also, because these small lots were at one time pieces of other lots they are sometimes located in what would normally be a back yard. The result can be a tall home built in a back yard with little setback, which understandably generated neighbor complaints. Last month this resulted in emergency legislation to end small lot construction until permanent rules could be put in place. Wednesday’s discussion was the next step in creating permanent rules. On the developer’s side, Michael Ravenscroft (actually a realtor) described a vision of busy neighborhoods, dense neighborhoods, and continued housing construction. He argued that single family construction is needed drastically, and because of limiting codes very few homes have been built in Seattle. In the middle, architect Brad Khouri advocated for diversity of structures in our neighborhood. He wants something supportive of the growth that’s happening in Seattle, and wants to find some room for affordability. On the neighbor’s side, John Taylor explained that we buy homes rather than rent them because we want predictability, to control our house and to some extent control our neighbors. He believes standards should be well understood and not change. He used quite a few anti-development talking points (“out of character”, “open space”, “blocks light”), and implied that there should be a strict minimum of 2,500sf lot size in Seattle. Earlier this year, the Seattle City Council set a bad precedent by using emergency legislation to stop development of small-lot homes. The Capitol Hill Community Council has now asked the City Council for more emergency legislation to block development. Their target? Apodments. Apodments are a form of townhouse development where each townhome “unit” is broken into several rooms for rent. The result is very small, inexpensive units and high density. Several have been built in Capitol Hill, which makes sense due to this neighborhood’s low-rise zoning and great walkability (apodments generally don’t come with parking spaces). The Capitol Hill Community Council argues that Capitol Hill has met development goals and implies they don’t want any new development. They also claim that apodments violate the “neighborhood context” and that they have “undefined environmental impacts”. I notice that both of these reasons are vague at best. “Neighborhood context” is purely a matter of opinion. I don’t live on Capitol Hill, but it sure seems to me that if low to mid-rise dense housing fits any neighborhood’s context it would be that neighborhood. But the term is vague enough that it could be describing anything. Are the units too brightly colored? Are they using wood siding instead of brick? Are the intended residents too poor? “Undefined environmental impact” is even worse. Bacon has undefined environmental impact – should we expect the next emergency legislation to ban bacon? Of course, what they really want is design review and SEPA (State Environmental Policy Act) reporting. These two processes significantly add to the cost and timeline of projects, which is why buildings this small are exempted. In the end I can’t see how SEPA would substantially change these projects, and design review often makes only minor changes like requiring expensive facades. It’s hard to believe it’s in the city’s interest to require low-income residents to pay for brick siding, and that not doing so constitutes an emergency. My view is that the real emergency is finding a way to provide affordable housing within the city, and to add new residents here rather than sending them off to the suburbs and beyond. If we are going to take the Free Ride Zone away from the urban poor then I think it’s time to take Free Parking away from the Suburban Commuters. 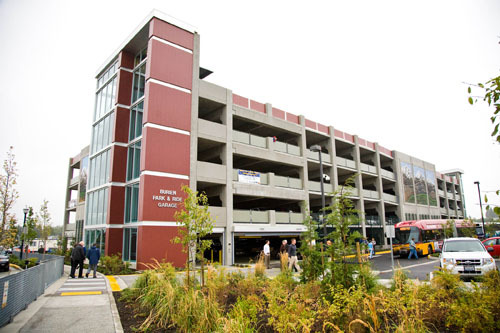 Why in the world are we giving away free parking spaces? It makes no sense to be shutting down lines and reducing services while at the same time people are parking for free! End Free Parking!! In theory, the reason that we’ve spent millions of dollars on free parking at park-and-rides is to lure suburban commuters to take the bus. Yet Metro is willing to lose millions of rides per year by ending the Ride Free Area. I’d argue that in addition to boosting ridership, free park-and-rides encourage people to live in sparse, sprawling locations. These locations are generally car-dependent, and add many miles of car trips to school, shopping, etc. Without free park-and-rides there’s a greater incentive to live in an area with good bus service within walking distance, and this fundamentally means a more dense environment. In contrast, the Ride Free Area encouraged people to travel around downtown Seattle which indirectly encouraged businesses to locate downtown. This tended to increase business and residential density as well as transit use. 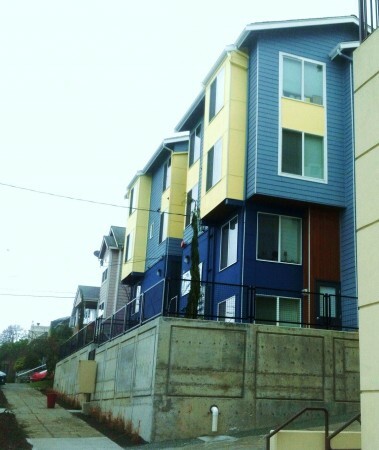 Recently a developer has been using a loophole to build small-lot houses in SF5000 zones in Seattle. 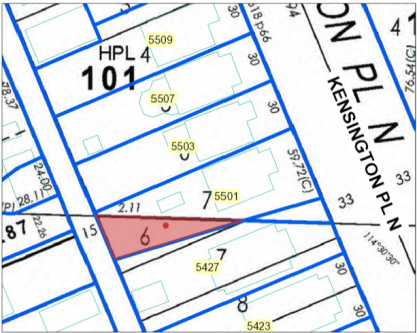 Single family zones are classified by the minimum lot size allowed for each home, and the options are SF5000, SF7200, SF9600, and residential small lot (as low as 2,500 square feet, but there aren’t many RSL zones in Seattle). Publicola reports that Richard Conlin has proposed interim legislation to end this construction of small lot homes in single family zones. Conlin’s legislation is exactly the wrong direction for a growing city. Over 27,000 new households predicted to move to Seattle between 2010 and 2020 in Seattle’s Comprehensive Plan’s Housing Appendix (PDF). Yet the same appendix predicts only 865 of those households will have children. We’re out of space for single family homes, and it’s time to question whether every one needs to take up as much land as they’re currently required to. We live in a city, not the suburbs. SF5000, 7200, and 9600 zoning probably made sense 100 years ago when Seattle was a small city, trying to plan out the next 50 years or so. But we’ve grown well beyond our original vision. I propose we remove minimum lot sizes on single family homes, or at least dramatically reduce them. We aren’t building many new single family homes, so removing minimum square footage requirements won’t dramatically change our city. But as homes are redeveloped, it will allow more homes to be built on the same amount of land. This will increase density and allow more people to live in Seattle even if they want to live in single family homes. A city-wide change like this will spread out new development, changing each neighborhood slowly and by a small amount. Write your Council members* immediately and tell them what you think about this – they’ll meet on Monday to vote on the emergency legislation. Update 9/10/12: The City Council passed this emergency legislation. Of course, it’s still possible that they could take up my proposal and reduce/remove SF lot size minimums. This car is about to zip by me at high speed while I’m at the edge of his lane. There are several streets in Seattle that function more like highways, or even freeways, than city streets. If you routinely cross Rainier, Denny, 15th Ave NW, or one of the other dozen or so 4+ lane streets at an uncontrolled intersection, then you know what I mean. Let’s take my commute as an example. 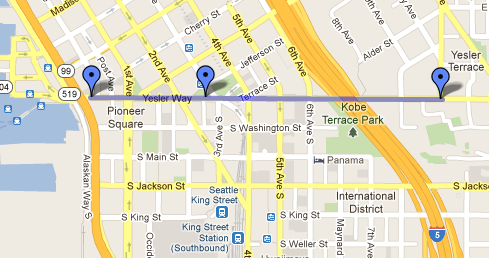 The pedestrian portion of my commute involves crossing Rainier Ave S. at S. King St., which has no marked crosswalk. May I present my next dream: the Yesler Way Gondola. Although this probably isn’t the most important line for a gondola in Seattle, this might be a good place to start. Consider that we’re about to begin two massive projects: Yesler Terrace redevelopment, and the waterfront redevelopment. If we’re going to build gondola stations, it would be cheap and easy to add them to projects that are being built anyway. Consider also that both of these locations suffer from pedestrian access because of hills. There are likely a large number of ferry passengers and waterfront tourists that would love an easy connection to Link light rail. There are also 4,500(!) new housing units about to be built at Yesler Terrace that would love a quick and easy ride to that same transit service. The route is a very short one, which would be appropriate for Seattle’s first gondola line. At 3,700 feet that’s around a 3 minute ride from end to end, adding another minute or so for the Pioneer Square Station stop. Witnesses described the shooter’s attire and detectives pored over surveillance footage from Metro buses and located their suspect on video. They were then able to show the suspect’s photo around and come up with a name, said one source with knowledge of the investigation. 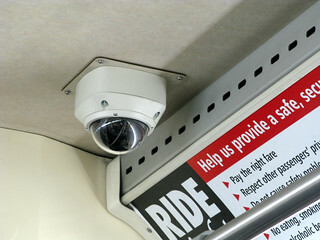 Although Seattle has no stationary public crime cameras and police aren’t allowed by law to to use red light cameras to help solve crimes, there are a large number of cameras on King County buses. Ferrari was shot while driving in the Central District on May 24. He is said to have been active on this blog. I’ve since learned that Justin was a frequent reader, and commented under the user name justinf. Here are search results of all of his comments at STB. From what I’ve read he was intelligent, interesting, and knew his buses well. More details have come out on how the alleged murderer was located and arrested. Zach had a post up yesterday that should be embarrassing to government employees at many levels. I’d like to offer those in power a solution that seems to work very well, and might provide a low-cost, almost foolproof way of identifying these problems in the future: listen to your customers. Though there are various ways to accomplish this, my absolute favorite method is used by Seattle’s Department of Transportation. 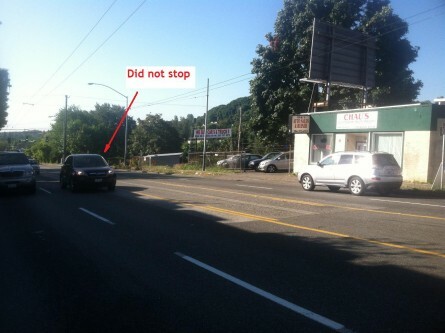 SDOT has a blog, and on that blog there is a page set up just to listen to the public. On this page a person can comment, and generally within a few days an SDOT representative comments back. The responses are simple and courteous, but almost always describe what branch of SDOT the problem is being reported to and how a problem is being solved. There’s also a page to report potholes, and they’re usually fixed within a day or two of reporting them. Imagine if this process existed for King County Metro – it seems highly unlikely those announcements would continue for a year. I’d actually love to see this throughout government. How Do We Build Skinny Storefronts? Commercial space from Mt. Baker Lofts. Notice it could be three small, deep shops with narrow storefronts. A recent article from the other Washington touched on a conflict in the urban retail world: shoppers want small independent stores, and creditors want to fund big chains. This is apparent when you look at almost any urban retail space built in the past few decades. You’ll see shallow stores with wide storefronts designed to make sure you don’t miss the store’s presence. But walk through any old section of town and you’ll see skinny storefronts and deep stores designed to fit the maximum number of shops on one street. What does this do to the pedestrian experience? Walking past 10′ to 20′ storefronts means you pass a new store every few seconds, and constantly have something to look at. Because stores are smaller rents can be much lower, allowing more independent stores. The sheer number of storefronts you pass on a typical trip means you have much more variety in shopping options. In short, the old style is a hands-down win for pedestrians. Everyone knows this – that’s one reason old retail areas in cities and towns across America have far more character than the new ones. But they just don’t build them like they used to. So how do we return to the skinny storefront days? We could simply legislate it (new buildings shall have storefronts with a maximum width of…), or encourage it (height bonuses?). I’m not sure just refusing to tear down old buildings is the best solution, but that’s an option too. Any other ideas? One convenient feature of having a strong central city is that it allows a region to build a good transit system. The unfortunate trend in the past few decades to move jobs into the suburbs has seriously degraded this transit potential. 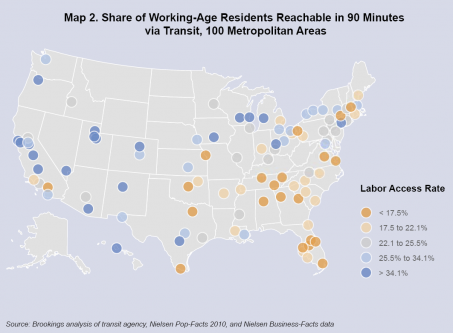 Brookings released data this week detailing both how accessable jobs are via transit, and the share of working-age residents that can access these jobs within 90 minutes using transit. In Seattle (pdf), we do quite well in terms of serving jobs with transit. In fact, we’re #3 in the nation, with 99.3% of all jobs accessable by transit in our region – and a full 100% accessable by transit in our cities. However, those rosy numbers don’t show the full picture. It’s not important that you can get to your job from somewhere, you want to reach it from your home. This number shrinks all the way down to 30.8%, 26th in the nation, and represents the percent of the metropolitin population can reach a typical job within 90 minutes using transit. Why is there such a strong difference between these numbers? Because a hub-and-spoke model transit system requires a long journey often in the wrong direction to go from two points that aren’t near the hub. If you live in a suburb and you work in a different suburb, there is likely no easy transit access between your work and your home. An efficient region would have most jobs in a central city, and our region has lost this transit efficiency as jobs have grown in the suburbs. As I walk through a typical neighborhood I’m amazed at the conspicuous consumption that American front yards represent. Considering front yards are rarely used for anything other than displaying gardening skill, and considering that a home is the most expensive purchase most of us will ever make, and further considering that much of the value of an urban house comes from the land that home sits on, it seems like an ostentatious display of wealth. Of course, this excess isn’t necessarily something we chose. In Seattle, as with most towns and cities, it’s required by law. 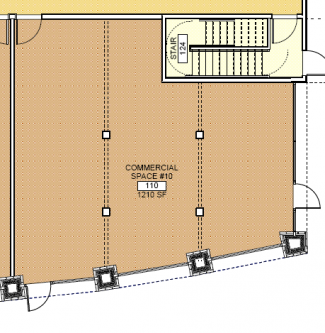 In Seattle, your house built in a Single Family House (SFH) zone is requied to have a minimum of a 20′ deep front yard. 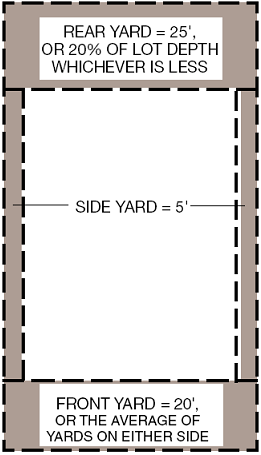 This is likely a very old law or standard, as my 110 year old house was built with a 20′ front yard. What Would You Do With the Old 520? Imagine stumbling across 363,000 tons worth of concrete pontoons in the free section of Craig’s List. Would you build a floating island? A massive version of Stonehenge? Perhaps stack them on top of each other for a 33 story condo complex? Well this is your chance to show off your idea for what our state should do with these massive blocks of concrete. Come up with a brilliant idea, create a shiny and compelling poster to describe it, and you might win $3,000. Head over to RETHINK REUSE for details.